FREDERICK, MD- An 8-0 lead was squandered late in the game as the Frederick Keys (1-6) lost 11-8 to the Fayetteville Woodpeckers (4-3) who complete the series sweep on Wednesday night in Frederick. Trailing 8-7 in the seventh inning, the Woodpeckers loaded the bases for Chandler Taylor who mashed a grand slam to make it 11-8. 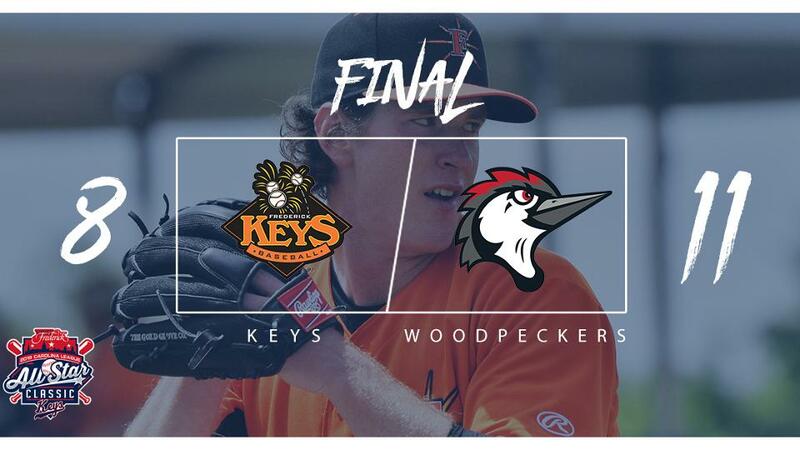 The Keys offense could not crawl back despite good nights from Jomar Reyes and Ryan Ripken, who both hit home runs. Frederick jumped out to an early 2-0 lead in the second inning after run-scoring hits from Yeltsin Gudino and Mason McCoy. In the third inning, Ripken hit a two-run shot to right-center field, and Reyes followed suit in the fourth frame to make it 6-0. McCoy and Reyes again tallied RBIs in the fifth inning to give Frederick a commanding 8-0 lead. Keys starter Michael Baumann was excellent in his season debut, tossing five scoreless innings of one hit baseball while tying a career-high with 10 strikeouts. The bullpen faltered in the sixth inning, however, as the Woodpeckers took advantage of five walk and two big hits from Miguelangel Sierra and Jonathan Arauz to total a seven-run inning that brought the game within a run, 8-7. Matthew Hammonds was charged with six runs on five walks and was relieved by Matt De La Rosa (0-1, BS) who surrendered the grand slam to Taylor. Fayetteville reliever Carlos Sanabria (2-0) pitched three scoreless innings in relief and struck out five batters while Cesar Rosado (S, 1) shut down the Keys in the ninth. The Keys hit the road for a seven-game road trip starting with a four-game series against the Salem Red Sox. LHP Cameron Bishop (0-0, 4.50 ERA) take the mound for the Keys while RHP Bryan Mata (1-0, 1.59 ERA) starts for the Red Sox. Pregame coverage begins at 6:45 p.m. on frederickkeys.com and the TuneIn radio app. For a complete look at the 2019 Keys promotional schedule fans can visit frederickkeys.com.